Plastic in our waters – it is widely acknowledged as being a problem for the environment, animals and our own health. In the media it is referred to as the “plastic soup” and attention is given to possible solutions. Images of beaches covered in plastic litter that has been washed ashore and animals strangled in abandoned fishing nets nowadays often make way for coverage of clean-up activities. Yet this should not distract from the fact that the problem is fundamental, global and complex. As a result, so are the solutions. We believe the problem of the plastic soup can be solved if a wide array of measures are taken on a global level. We have come across some inspiring solutions in the Netherlands that help tackle the issue and visited two clean-up solutions, Plastic Whale and Grondstofjutters. Below is some background information on the problem and a description of some solutions we have found. Where does all this plastic originate? Some Asian countries seem to cause most plastic waste, yet dealing with this issue must be a priority of every country. After all, it does not matter where the plastic comes from, after it reaches the ocean, the currents carry it all over the planet, thereby making it a global problem. While garbage collection and disposal is well organised in some countries, in others the lack thereof is one of the factors contributing to the plastic soup. This is well illustrated in a short film about the situation in Cambodia’s capital Phnom Penh. It is the unique qualities of plastic – lightness and durability – that make it attractive for producers, but at the same time make it such an environmental hazard. As plastic get into water it devastates ecosystems and wildlife across the planet. Marine animals eat it and get entangled in it, slowly killing them. This even happens on remote islands, as Chris Jordan pictured in the film “Midway”. As larger pieces of plastic disintegrate into smaller particles through sunlight and weathering, they form micro particles, meaning pieces smaller than 5 mm. Car tyres, cosmetics (micro beads) and synthetic clothing are also major sources of micro particles that end up in the oceans. Due to their small size, they are virtually impossible to remove from the marine environment. Plastic micro particles are found in shellfish and many other marine species around the world. Contained in plastic (and found in marine life) are chemicals, such as to bisphenol-A (BPA) and phthalates. Exposure to them has been associated with negative health outcomes in animals and humans. In fact, human bio-monitoring studies demonstrate that people in the US and Europe are already widely exposed to these harmful chemicals. In addition, plastic particles collect and thereby concentrate other toxic substances such as PCB’s and DDT, which exacerbates the negative health impact of plastic. Although no direct link has (yet) been found between toxics in seafood and human health, only limited research has been done in this field and a risk certainly exists. Among other reasons, this is why the United Nations has labelled plastics in our oceans a ‘common concern of humankind’. See also their detailed findings in the Marine Plastic Debris report. A documentary film covering most of the issues mentioned here will soon be available, check the site of “A Plastic Ocean”. We believe a variety of solutions are required in order to solve this complex, global problem. These need to be executed by various parties, most notably consumers, companies, governments and NGOs. It’s all hands on deck, there are no quick fixes. We describe the different actions that are required below, as well as what is happening in the Netherlands in those areas. Create a culture of awareness and education. Everyone should understand the devastating consequences of plastic litter and act accordingly. It should become socially unacceptable behaviour to litter. In the Netherlands, numerous stakeholders raise awareness for the issue. Schools have programs that make kids aware of the plastic soup and encourage them to join clean-ups, such as the program developed by the Plastic Soup Foundation. The Plastic Soup Foundation also contributes to the solution by promoting international cooperation, supporting projects by and with leading enterprises, and disseminating good practices. In addition, using social media to disseminate independent research, they put pressure on industry and governments to realise true change of practices and policy. A public / private partnership between the Dutch Government and industry is campaigning under the name Clean Netherlands (“Nederland Schoon”). While this is effective in raising awareness using various communications channels, it should of course not be an excuse for not implementing further measures. Reduce use. With awareness comes the need for behavioural change. 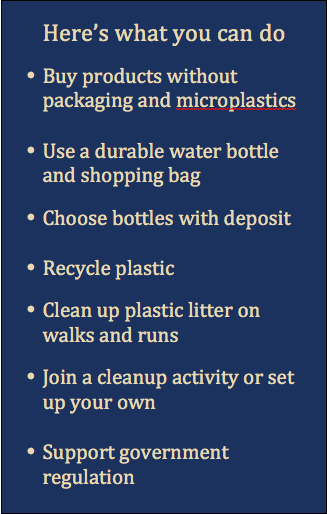 The best way to avoid plastic litter is not to use plastic in the first place. Some even strive for a zero-waste economy. This is challenging, but there are quick-win examples, such as bringing your own bags to do shopping or even shop at a package-free store. Switch from one-way bottles to durable (refillable) bottles and refuse (free) plastic gadgets or gifts in shops. 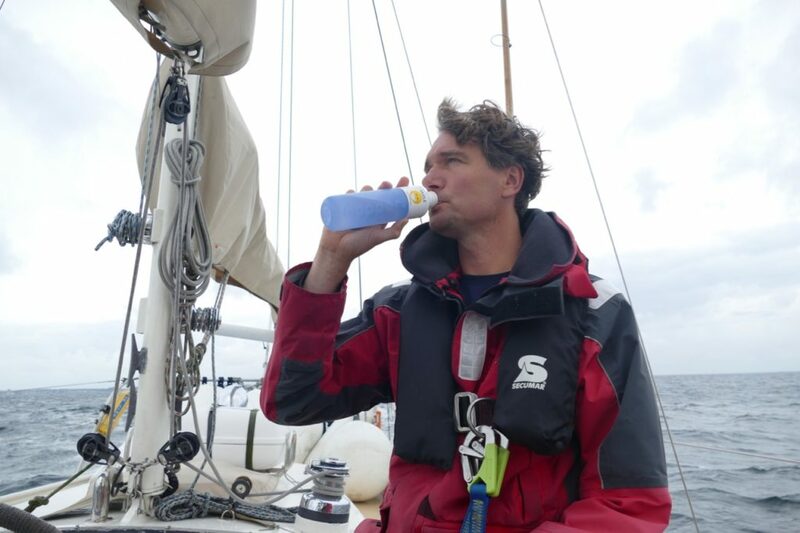 A social enterprise making durable water bottles was establised in the Netherlands. Using smart design and a trendy look and feel, Dopper eliminates the use of single-use plastic bottles. Their own bottles can be recycled at the end of their lifespan. As a side-benefit to reducing plastic waste, filling it with tapwater also eliminates transportation and promotes use of tap water, which is of excellent quality in the Netherlands. Waste separation and recycling. A basic public service that uses different waste streams such as glass, paper, organic, plastic and other is essential for proper recycling. It raises consumer awareness and separates the waste into valuable resource streams. Throughout the Netherlands, waste collection has been properly organized. Typical waste streams in many municipalities are glass, paper, organic and other. Plastic waste collection has picked up in Amsterdam and 80 other Dutch municipalities in recent years, driven by a Plastic Heroes campaign. With regard to plastics, recycling is challenging, as there are so many kinds of plastic. Recycling plastic in practice is actually downcycling, meaning that the plastics are turned into a lesser product that can no longer be re- or downcycled. In other words, recycling alone should not be seen as the solution to the problem. Place a value on returns. A deposit scheme on packaging materials usually works quite well to change behaviour. Many people are motivated to return the packaging materials to the collection point if get money in return. Some beer and beverage bottles sold in the Netherlands are subject to a deposit scheme. The manufacturing and retail industries are lobbying against this for cost reasons, while environmental groups are lobbying to keep and expand it for the beneficial effects on the environment. The controversy has been going on for years and has recently become a parliamentary issue. We believe it should be expanded, simply because it works so well. Have a look at the social experiment in the Netherlands that nicely demonstrates the positive clean-up effect of a deposit scheme. Check out the short film (in Dutch, but self-explanatory)! Regulate. Governments could ban the most outrageous elements of this problem, such as toxic substances in plastics, (free) plastic bags and micro beads in cosmetics. They could also require deposit schemes on packaging material and fine littering. Environmental NGOs like Greenpeace are campaigning to fight plastic soup by calling on governments to take more stringent measures. An example of impactful regulation by the Dutch government was recently implemented. As of 1 January 2016, it became illegal for stores to provide free plastic bags to customers. This ban on plastic bags turns out to be quite successful: within a few months 83% of customers started bringing their own (durable) bags. Material innovations / alternatives. We need biodegradable, toxic-free materials that are fully recyclable and don’t cause harm when they accidentally end up in the environment. This is not easy and there are not many workable solutions yet as also described in a UN Report. Material is often not biodegradable in marine conditions, but only in warmer temperatures and with sufficient sunlight. Clean-up. Besides working on all the prevention actions described earlier, we also need to remove all existing plastic from the seas and beaches. The sooner we do that, the less micro plastics will end up where it is impossible to remove and will poison the food chain for generations to come. While the sheer amount of plastic already in the oceans may make clean up activities seem symbolic, we experienced ourselves how rewarding and fun they can be. One becomes connected to the issue and gets motivated to do more. Besides, every bit helps if we all do our part. We visited Plastic Whale and Grondstofjutters, two Dutch clean-up initiatives. Plastic Whale is a foundation/social enterprise founded by Marius Smit. He started plastic fishing in Amsterdam and built a boat from part of the plastic waste found in the canals. This became a big success and when we joined them for a day of fishing the day after King’s Day they already had six boats (with the seventh in production), all electrically powered. We experienced first hand how fanatic one gets cleaning the canals and are proud to appear in a video about the day. In addition to organising public fishing days after some of Amsterdam’s biggest events, Plastic Whale takes school children plastic fishing to raise awareness and educate them about the impacts of plastic. They have found a business model largely based on sponsoring from companies who see this as part of their Corporate Social Responsibility program and regularly go plastic fishing as a team activity. Plastic Whale also found a way to use the plastic bottle caps from the canals into unique skateboards and generate income from them. Grondstofjutters (Resource collectors). 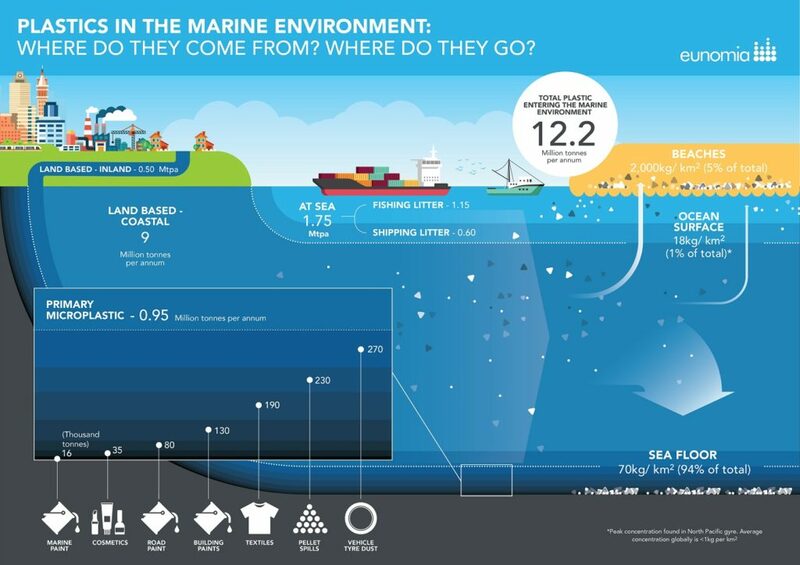 The concentration of plastic waste on beaches is relatively high, at around 2,000kg/km2 (see infographic above). 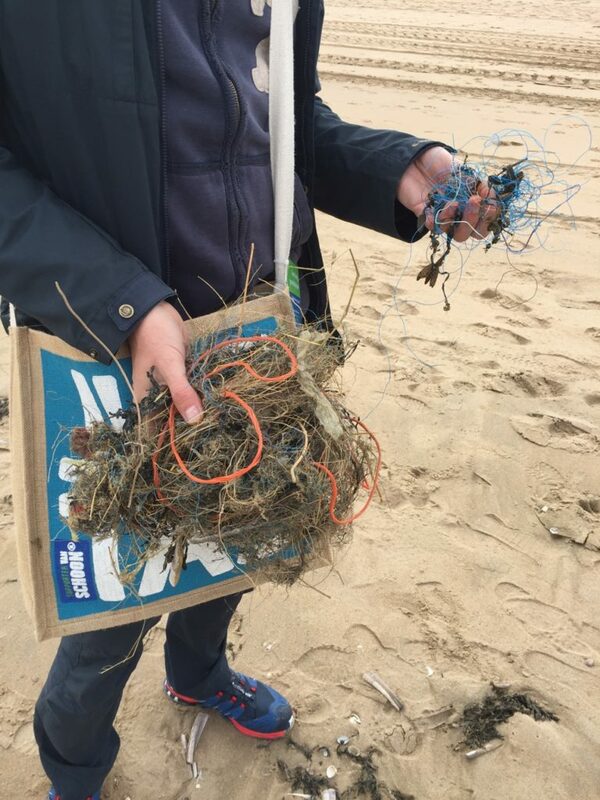 While some plastic may have been dropped directly and other washed up, it is clear that there is a ‘flux’ of litter between beaches and the sea. By removing beach litter, we therefore also clean the oceans. Against this background, it is very sensible to focus on beach clean-ups. Grondstofjutters founder Noortje Schrauwen makes plastics valuable again. The activities are supported by the municipality of Katwijk aan Zee (a Dutch beach town), the local beach clubs, and a local waste recycling company. She has successfully introduced the concept to beach goers by explaining her approach at the beach entrances. People are invited to 1) collect a bag, 2) walk the beach and pick up the waste, 3) separate the waste at one of the participating beach clubs and return the bag there, and 4) enjoy a free drink or ice-cream as a reward. The waste will then be used as a resource for new products. We found it so much fun that the free coffee wasn’t necessary to make us do this, but still found it a very nice gesture. As a side effect, it increases customer traffic at the beach clubs and will surely win over some people to participate. To make further use of the plastic and make it fun for children to participate, a solar oven has been developed that makes beach toys for kids from the plastic they found, right at the beach. The public water service (Waternet) in Amsterdam, which does a great job cleaning the canals as part of their daily work. The Ocean Cleanup. Boyan Slat, a young Dutch engineer is the founder of the project that is designed to collect plastic waste directly from the ocean gyres by using long arms and the oceans currents. He developed advanced technologies with great potential: one passive system could theoretically remove about half the Great Pacific Garbage Patch in 10 years. A prototype is currently being tested outside the Dutch coast. Stichting Noordzee. The Dutch North Sea foundation’s mission is to protect the North Sea. They work towards sea reservations, sustainable fishery, renewable energy (wind parks) and waste reduction. An example of the latter is the so-called “beach clean-up” which regularly takes place with the help of volunteers. Together the clean the entire Dutch coast. Ghost Fishing. The diving community has also stepped in with the Ghost Fishing initiative. Abandoned fishing nets not only kill marine life but can also be dangerous for scuba divers. In the past 8 years they have removed a very large amount of nets, fishing gear and other marine debris from shipwrecks, reefs and the seabed. By doing this they have gathered comprehensive experience and developed their own techniques which they aim to share with the diving community worldwide. Since we got involved in some of these great initiatives, we couldn’t resist doing some cleaning up ourselves. 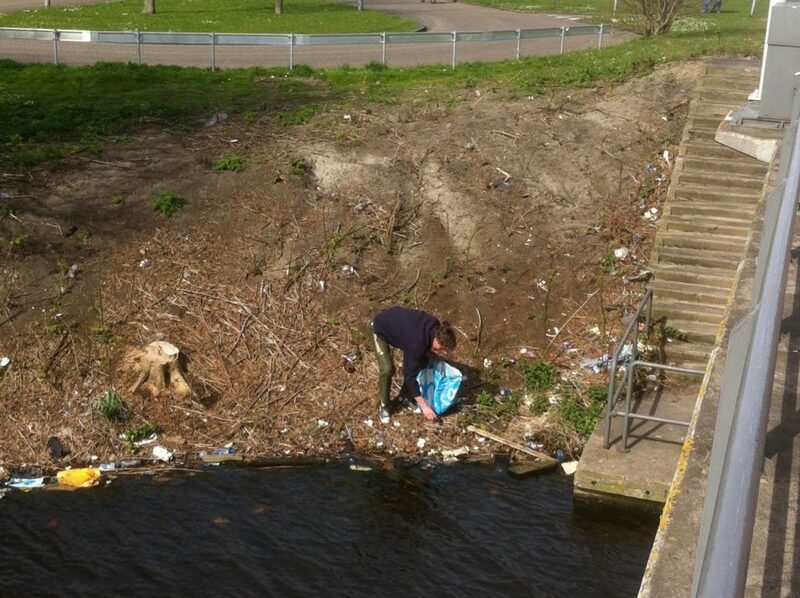 We cleaned up a section of the NDSM area in Amsterdam, and made it a habit to pick-up plastic during our regular runs. We also did some plastic fishing in the harbour of the Dutch town of Harlingen. Co-incidentally, we met local plastic fishing hero Henk Prins during the act. We look forward to doing this around the world and seeing which other great people we’ll meet!